I am going to Italy this easter and to get into the holiday mood I went into boots and saw the 3 for 2 offer on all these cute little travel essentials and I couldn’t resist buying them. The first item on my holiday check list was tooth paste and a little tooth brush. I brought a little tube of Colgate Total tooth paste, it’s small and doesn’t take up a lot of room in my bag. I love Colgate tooth paste because it’s not too minty and it makes your teeth and breath smelling and feeling fresh. The little travel tooth brush I brought is great, it opens out to become a normal sized tooth brush but when taking it on holiday and packing it away you can fold it in half and reduce the size so it doesn’t take up too much room. My next essential travel item was shampoo and conditioner. I am in love with the Aussie shampoo and conditioner so when I saw that they had little travel size bottles I had to get them straight away. I love the smell of the Aussie shampoos, It smells really fruity but also sweet like candy. I brought the ‘Miracle Moist’ shampoo and matching conditioner, my hair isn’t that dry but when i’m on holiday and i’ve been in the sun a lot my hair tends to become a bit dry and flat, the ‘Miracle Moist’ shampoo helps to give my hair some shin and makes it become a lot healthier. Normally Aussie products are quite expensive for shampoo’s and conditioner’s but they are the best shampoo’s for a different range of hair styles and types. The smell of Aussie products is just a bonus. My must have essential travel item is Batiste dry shampoo and Nivea Pearl & Beauty 48h deodorant. Batiste dry shampoo is an amazing product for days when you don’t really need to go out of the house or just lazy days when you can’t be bothered to wash your hair, it makes your hair shin and gives it a bit of volume. I love dry shampoo, it is a must have.. I can’t leave the house without it. As for the Nivea Pearl & Beauty 48h deodorant, this is a must have as well, it does what it says on the tin. It is long lasting and smells so good. Deodorant is a must have especially on holidays where it is hot and you can become sweaty. My last travel essential must have is Soap & Glory shower gel and body cream. Every soap & glory product smells absolutely delicious, I love all of the products but the ‘clean on me’ shower gel is amazing, it smells like marshmallows and it makes your skin so soft and leaves it feeling fresh and clean. It is a definite must have for holidays and everyday use. The soap & glory body cream moisturises your skin leaving it really soft and moist. I love this body cream it also smells gorgeous. Soap & Glory products are not that expensive and they always have 3 for 2 offers on all of their products. I hope this post helped you pick out some travel products for your summer holidays. 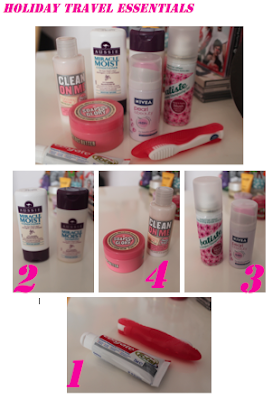 Comment below if you agree with my comments or have tried any of these cute mini travel products.